So That’s What “Build Your Brand Story” Means! Home/Branding, Online Marketing, Social Media/So That’s What “Build Your Brand Story” Means! A confession: I don’t know much about branding. Oh, sure – I know words, but branding? That’s Gabriella’s bailiwick. I know more now than I did six or seven years ago, but that’s because she’s been my mentor for several years (and you can’t have a client-centered conversation with Gabriella without branding coming in to it). So, when Level343 posts blogs about branding, that information comes either from Gabriella or information I’ve gleaned from her through the years. If you’re a regular reader, you’ve come across several articles here about brand building and social media. We talk a lot about social media and using it as a way to “build the story of your brand”. Whenever Gabriella talks about it, I’ve always just nodded my head, thinking I sort of got it, but figuring I never really would. Today, I’m feverishly typing up this post for your consumption because I’m excited. I finally got it. And in case you haven’t, I want to share this concept with you, so you, trying to follow advice and build your brand story, can get a better grip on what it means. At the time of this writing, I’ve just finished researching for an article. The topic (not the client) is Volkswagen ads. 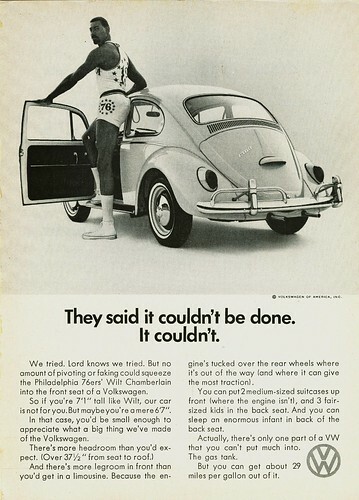 If you ever have some free time in the middle of your busy company building day, I highly suggest reading about the history of Volkswagen and its advertising campaigns. It’s fascinating, to say the least. 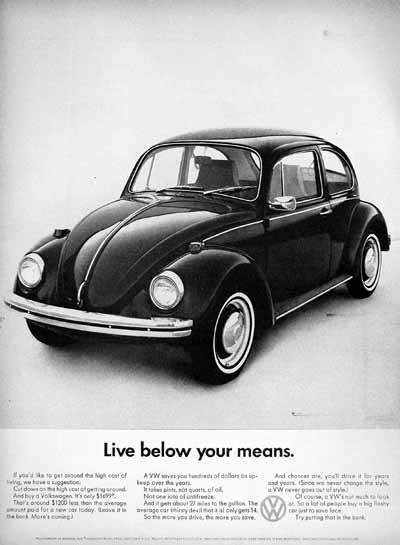 In 1959, Volkswagen had just started growing in the U.S. They contracted with an advertising agency to create ads focused on building brand advocates. Because, you see, brand advocates will do for a company what an ad never can – add a positive reputation. They talk about a brand, share it, tweet it, like it… they become the cheerleaders for a brand. And unless that brand does something really bad, they’ll always be the brand’s cheerleaders. It was designed by Ferdinand Porsche, an Austrian, for Adolf Hitler, a German dictator. During World War II, the manufacturing plant was turned into a forced labor camp for Germany. After the war, the British took it over, who then tried to pass it off to several places that turned it down flat, including Ford, Fiat and the French government. Americans didn’t want it, because it was too small and wasn’t “hip”. That is, until the mid 1950s, when college kids decided it was a good trendsetter. After reading the history of the company (admittedly, the facts weren’t summed up in quite so few words) up until they started using ads, I turned to the ads themselves. 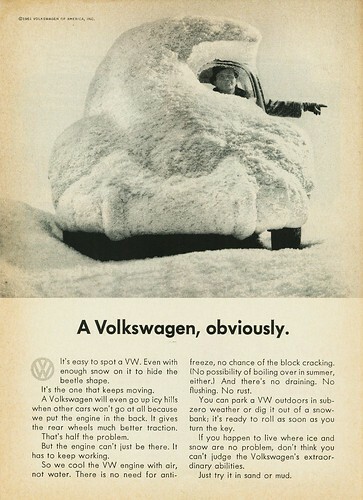 The advertising agency had to reinvent the Volkswagen for the U.S. market, because we still had a lot of hard feelings after the war. And they did. They took a German made car and turned it into a U.S. quality brand. How? With stories. The really fascinating thing about the Volkswagen ads is the stories they create. The first ad alone, “Think Small”, is a study in building a brand story. Each succeeding ad only builds on the entire story, like “33 years later, he got the bug”. 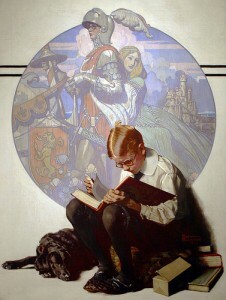 Increasing technology has only made them better, while still continuing the story, as seen in the Super Bowl commercial, “The Force”. This stuff was fascinating to me (witness the fact that I’ve used that word several times already in this post). What was more fascinating was my reaction. Up until this point, my only run in with the VW was Herby the Love Bug. I knew squat and cared less. Right after I finished researching, I was discussing all this new found information with a friend and it hit me: I liked the Volkswagen! Not only did I like the stories the ads told, but I felt warm and fuzzy towards the car and company! I stopped in mid-sentence, because the thunderbolt of wisdom slammed into my head. “Oh!” I even said it out loud. “So that’s what she meant by brand story!” I get it! I really get it! Listen. I doubt that there’s a single adult person out there who hasn’t visited a mom and pop store at least once in their lifetime. As well, I bet a lot of people know someone who runs one. Some would rather frequent a small, family-run store than a big brand store. So why aren’t you talking about it? You just spent a half hour leaning against your countertop while you talked to Betty Lou about her son’s athlete’s foot and the best remedies. This is your life. To you, you may just be having a friendly conversation. To Betty Lou, you just provided fantastic customer service! So why aren’t you talking about it? You run that parts store down on Main Street. Steve came in because he thought he needed a new alternator. While you’re helping him find the part to match his car, you two start talking about the problems. You think it’s probably something else, just by the way he describes it. After a 15 minute look at the engine in the parking lot, you show Steve that it’s not the alternator; it’s actually a frayed electrical system (which, by the way, is cheaper and easier to replace). This isn’t in your job description. You run a parts store, not a mechanics shop. Yet, you like cars and enjoy helping people. To you, it was a fun, satisfying 15 minutes. To Steve, it was money saved, extraordinary customer service and the start of a good business to customer relationship. So why aren’t you talking about it? That’s the real beauty of building a brand story, and the real lesson behind VW. The Volkswagen ad agency didn’t boost the brand by having a unique story. They boosted the brand by having a story people can relate to. If it’s unique, they can’t relate, can they? With all this social media use – Facebook, Twitter, YouTube, etc. – you have the perfect platform for sharing your brand story. If you aren’t, then what are you doing? What on earth are you even using social media for? By telling your story in the fashion of the example above, you’re actually sharing the story of a customer. Yet, the subtle undertone is about your quality service. You don’t have to be blatant about it; people will get the point without the pushy advertising. If you’re not already putting your story out there, I urge you to really consider it. Your story is special by the very fact that it’s common. It’s something that reaches out to people who have been either in your position or your customer’s, or knows someone who has. Look: the only way you’ll ever make friends is by letting them get to know you. The same goes for your company. Build that warm, fuzzy, friendly relationship with your market by giving them the story behind the brand!